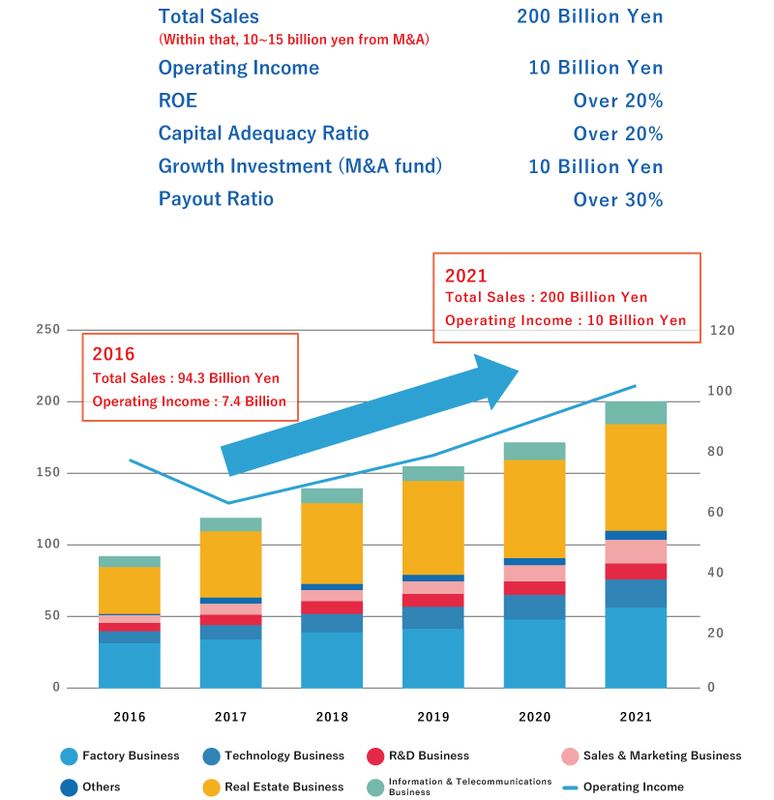 Medium-term management plan through 2021 | WORLD HOLDINGS CO., LTD.
World Holdings embodies its philosophies through our three core businesses. Through our human resources and education business, we “shape an evolving world for the people of today.” Through our real estate business, we “connect people to homes.” Finally, through our information technology and communications business, we “connect people to each other.” Our Medium-Term Business Plan 2021 includes this new vision of “shaping an evolving world for the people of today” and aims to make us “stronger and more stable than ever, with deep ties to society.” Its main points include stability through steady management at an appropriate scale, expansion of our business base, and social contribution to society through diverse industries. Through these three pillars, we will continue to expand and grow. 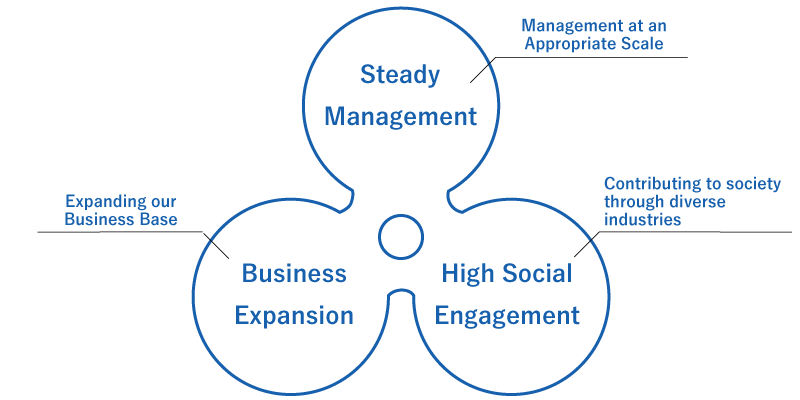 The first half of our plan focuses on optimizing our three core businesses, maximizing profits and performance. 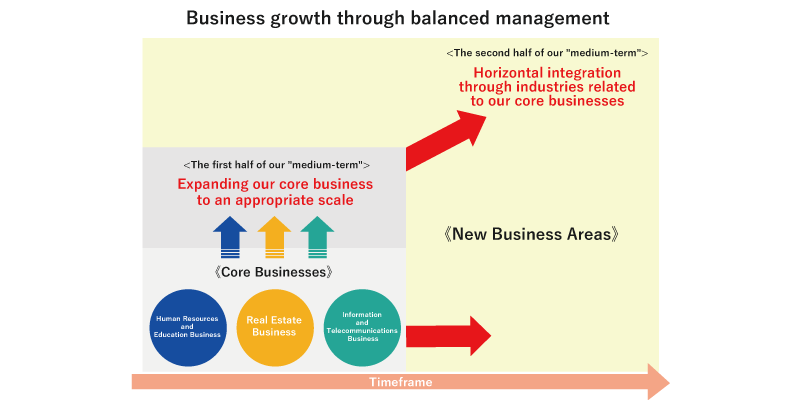 In the second half, we will break into new markets surrounding our core businesses, operating on a reasonable scale. Through integrated diversification, we will achieve balanced, stable growth and manage risk. We tackle the challenge of moving past traditional one-way job matching, into advanced bi-directional matchings. Declining populations are reducing the workforce. ・The acceleration of AI and robotics-enabled manufacturing is shrinking the employment market. Information sharing has lead to accelerated innovation as technological and human capital move faster than ever. This forces manufacturers to focus on core technologies and processes, while outsourcing secondary processes. Finding personnel with all necessary skills is an increasingly high corporate priority. Industry reorganizations around new compliance and licensing laws are increasingly salient. We have developed a popular, high-demand recruiting platform drawing on a deep recruiting pool through a wide variety of onboarding routes into the manufacturing industry. We enhance our recruitment efforts with training, career planning and formation, diverse educational systems, and intergroup collaboration and information sharing, creating an unbeatable human resources service. 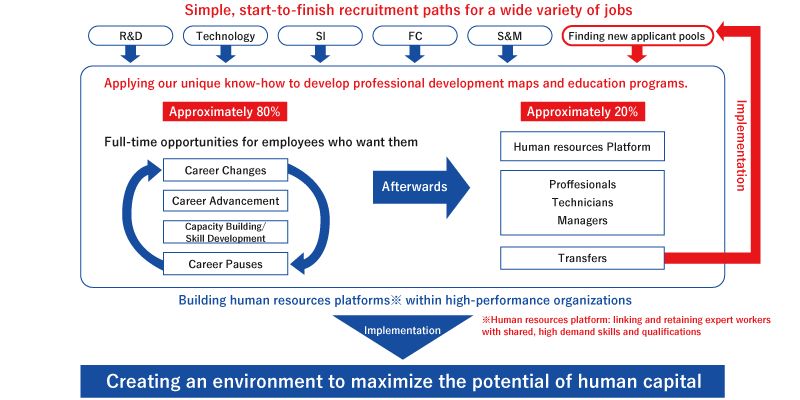 We promote organizational development and the development of internal human resources platforms. In addition to collecting and managing resumes, we convert “intangibles” such as candidate intentions into data systems. Our signature two-way recruiting helps tailor workplaces to applicants. Through our unique human resources systems, we match people to jobs and transform jobs into careers. 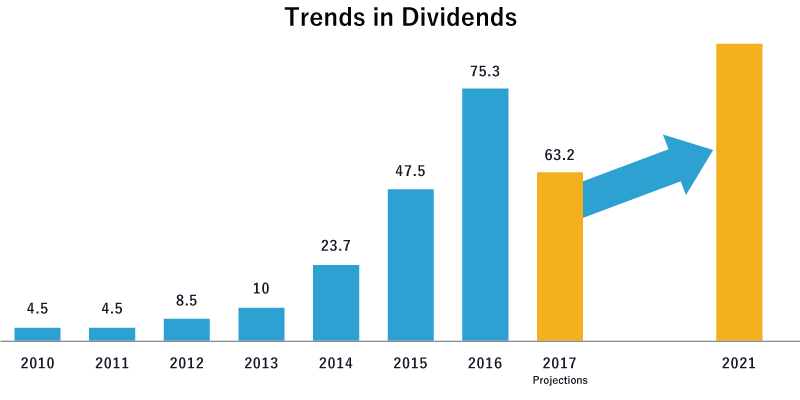 We optimize our profit structure through diversification to preserve core business strength while reducing risk regardless of changes in the economic environment. Increasing inbound business due to the Tokyo Olympic Games is accelerating the rise in land prices, rising construction costs, and rising selling prices. In the future, we will stabilize our cash flow by adjusting our profit composition to focus more on recurring revenue streams. 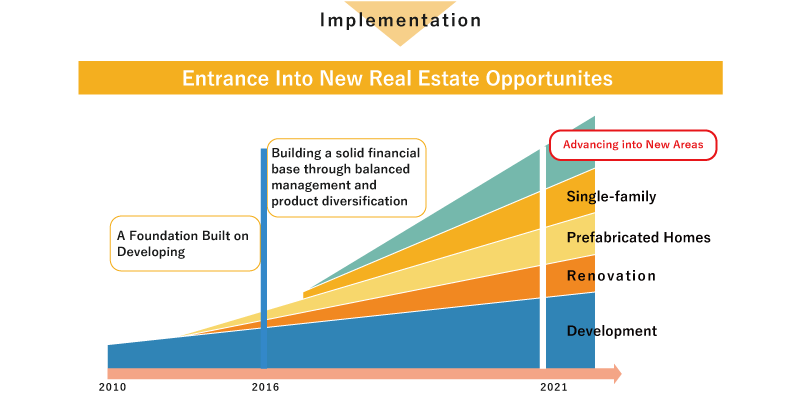 We will optimize our cash on hand and liquid assets to enable fast real estate investments capitalizing on quick timing through agile purchasing decisions. Integrated synergy between places (expanding our store network) and things (commodities). The environment has changed due to the establishment of guidelines by the Ministry of Internal Affairs. The emergence of MVNO is leading to intensified competition. We are investing capital in expanding our stores and in human capital, based on the belief that in order to sell great products, we need great storefronts with excellent service. A broad network of high-quality mobile stores helps us enlarge our customer base and engagement, boost profitability, and manage a broad recruiting pipeline. 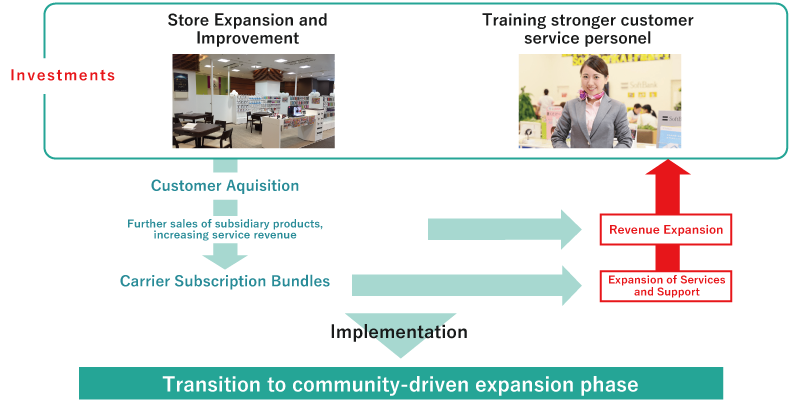 It also allows us to provide top-quality local support, and leads to a virtuous cycle of further investment in stores management yielding even higher profits. To reduce our dependance on mobile phone stores, we are developing a focus commodity materials as well. Until now, we have focused primarily on B2C shops within the information and telecommunications market segment, and on B2B with some commodity products. In the future, we will build a broader communications infrastructure to link our holdings, customers, human resources and more, and to develop more products for market distribution. While prioritizing reinvestment of capital into business growth, payout ratio continues to be 30%. See the following document for details. copyright 2019 World Holdings Co., Ltd. All Rights Reserved.